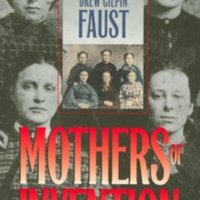 In Mothers of Invention: Women of the Slaveholding South in the American Civil War, Drew Gilpin Faust breaks down the Southern conception of women during the Civil War era to expose the social, emotional, and political shifts that transform women's role in society and in the home, specifically in the Confederate state of America. The Civil War challenged the established Southern patriarchal and racial institutions and reformed the idea of southern womanhood. Faust analyzes the personal relationship women had with southern politics and society, during this time, and provides readers with a sense of women's initiative and self-sacrifice to become a part of the broad national crisis and the revolution of women out of the private sphere and into the public sphere. Women fell in to the emergent southern ideology of womanhood during the CIvil War and many women embodied this new social and emotional philosophy. In particular, Faust includes the Civil War sentiment of one Catherine Ann Devereux Edmondston of North Carolina. Her devout Confederate patriotism lead to a division of her family and the ultimate convergence of her domestic and public realm. Faust, Drew Gilpin. Mothers of Invention: Women of the Slaveholding South in the American Civil War. Chapel Hill: The University of North Carolina Press, 1996. Catherine Edmondston worried about the vehemence of her secessionist views because of the divisions they were causing in her own family. Before Lincoln’s call for troops in April 1861, Edmondston’s parents and sister remained staunch Unionists, although Catherine and her husband of fifteen years strongly supported the new southern nation. Edmondtston found her resulting conflict very painful and was particularly distressed at having two disagree with her father. “ It is the first time in my life that my judgment & feelings did not yield to him.” It was a “pity”, she observed, that politics had become had become so heated as to “ intrude into private life”. Boundaries between what she had regarded as public and private domains were being undermined, as were previously unquestioned definitions of women’s place within the. As war consumed the South, Edmondston would find that little space was left to what she called “ private life”. The private, the domestic, would become part of the homefront, another battlefield in what was by 1865 to become total war. But women’s political ambivalence in the secession crisis arose from a deeper source as well: their uncertainty about their relationship to politics altogether. Admitting that they was women had no place in the public sphere, they nevertheless asserted their claims within it. Yet they acted with considerable doubt, with reluctance and apology, longing to behave as ladies but declining to stand aside while history unfolded around them. War had not yet begun, but southern women had already inaugurated their effort to claim a place and an interest in the national crisis. 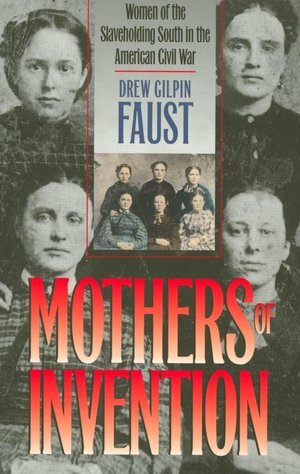 Faust, Drew Gilpin, Drew Gilpin Faust, Mothers of Invention (1996), Civil War Era NC, accessed April 24, 2019, https://cwnc.omeka.chass.ncsu.edu/items/show/57.